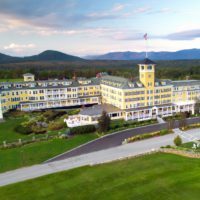 Located in the heart of New Hampshire’s White Mountains, the Mountain View Grand Resort & Spa is one of America’s truly grand hotels, combining first-class comfort with casual elegance and attentive, personalized service. With floor-to-ceiling views of the White Mountains and access to the prestigious Tower Spa, Mountain View Grand Resort & Spa offers hotel guests an experience unlike any other resort in the White Mountains of New Hampshire. Whether you are vacationing with your whole family or having a private, couple’s getaway, the Mountain View Grand Resort & Spa offers a wide range of amenities and activities, including golf, in-house spa treatments, health and wellness center activities, family activities, indoor and outdoor pools, Mountain View Farm, campfires with s’mores, Mountaineering Club, history tour, axe-throwing, dog sled adventures, movie theater and more!